Kaila is using Smore newsletters to spread the word online. 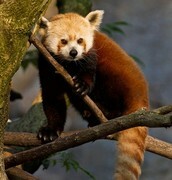 Red Pandas live in Asia in the countries of China, Nepal, Myanmar, Bhutan, and India. This amazing animal lives in the Himalaya Mountains in bamboo forests. 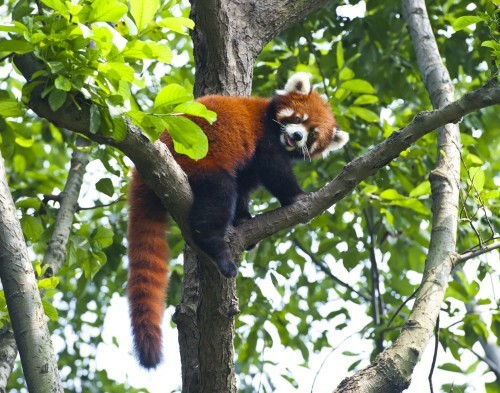 Red pandas will mainly be found in the tree tops on steep slopes. Red Pandas also like their surrounding temperatures to be chilly and wet. Red Pandas are amazing climbers. They are able to climb up thin trees because of their extra finger on each of their wrists. Even though they can climb trees, red pandas aren't the most active. This animal will spend most of the day in a tree eating food and taking naps. Red pandas have four paws and legs to walk ,and when they can not see they use their long, white whiskers to find their way around. Red pandas are chestnut colored animals and have a cream colored face. There fluffy tails are a pattern of chestnut and dark brown or black and when the red panda sleeps, it uses it's tail as a scarf! The bottom half of their body is a dark brown or black and have paws of containing sharp claws. Red pandas love to eat the stalks of bamboo and the leaves! The only thing that the red panda is not keen about bamboo is the tough parts. They also like to eat fruit and berries, but red pandas do not only eat plants. 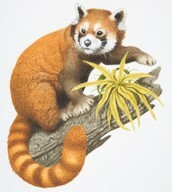 Red Pandas also eat eggs and small birds and mammals! Since they eat both plants and animals, red pandas are omnivores. Red Pandas "spend almost 13 hours a day" (Meet the Red Panda) eating! They also "eat almost 200,000 bamboo leaves every day"(Meet the Red Panda) which is a lot of bamboo! After mating season, red pandas will give birth to one to four baby pandas. Red pandas are born into a nest and are called cubs as babies. 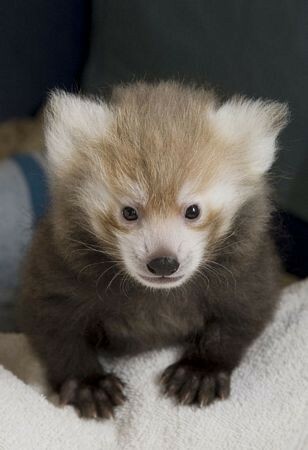 It takes 70 days for the red panda cub's fur to turn into it's chestnut, red color. The mother will stay and help provide for her cub/cubs until the cub/cubs are a year old. Red Pandas are able to adapt to the weather. There coat of fur helps them keep warm in the winter or in cold climates, so does their tail when they use it as a scarf to keep warm while it is asleep. Red pandas also have a body made for climbing thin branches making it easier to escape from attacking animals and poachers. Red pandas also have one more adaptation. They have a thumb-like extra finger which helps to take hold of bamboo. Aigner, Karine. "Red Panda: Sitting in a Tree." SIRS Discoverer. N.p., n.d. Web. 12 May 2016. <http://discoverer.prod.sirs.com/discoweb/disco/do/article?urn=urn%3Asirs%3AUS%3BARTICLE%3BART%3B0000297821>. "Baby Red Panda at Washington's National Zoo." Gale Research. N.p., 2009. Web. 11 May 2016. <http://go.galegroup.com/ps/retrieve.do?sort=RELEVANCE&docType=Photograph&tabID=Images&prodId=MSIC&searchId=R2&resultListType=RESULT_LIST&searchType=BasicSearchForm&contentSegment=&currentPosition=1&searchResultsType=SingleTab&inPS=true&userGroupName=auro18260&docId=GALE%7CCT4099912540&contentSet=GALE%7CCT4099912540>. Corrall, Simon. "Red Pandas." RSPCA/Animal Action Magazine Oct.-Nov. 1999: n. pag. SIRS Discoverer. Web. 11 May 2016. <http://discoverer.prod.sirs.com/discoweb/disco/do/article?urn=urn%3Asirs%3AUS%3BARTICLE%3BART%3B0000110158>. Garcia, Daniel. "Red Panda in a Tree." SIRS Discoverer. N.p., n.d. Web. 13 May 2016. <http://discoverer.prod.sirs.com/discoweb/disco/do/picture?picurn=urn%3Asirs%3AUS%3BIMAGE%3BTHM%3B0000137106>. "Hope for the Red Panda." National Geographic Kids June-July 2009: n. pag. SIRS Discoverer. Web. 12 May 2016. <http://discoverer.prod.sirs.com/discoweb/disco/do/article?urn=urn%3Asirs%3AUS%3BARTICLE%3BART%3B0000297821>. "Meet the Red Panda." Humpty Dumpty's Magazine July-Aug. 2014: n. pag. SIRS Discoverer. Web. 14 May 2016. <http://discoverer.prod.sirs.com/discoweb/disco/do/article?urn=urn%3Asirs%3AUS%3BARTICLE%3BART%3B0000368112>. Morris, Pat, and Amy Jane Beer. Mammals. N.p. : GD, 2003. Print. Vol. 1 of Small Carnivores. Neidigh, Sherry. "Red Pandas and Giant Panda." SIRS Discoverer. N.p., n.d. Web. 13 May 2016. <http://discoverer.prod.sirs.com/discoweb/disco/do/picture?picurn=urn%3Asirs%3AUS%3BIMAGE%3BTHM%3B0000115898>. Noble, Phil. "Red Panda: Walking in the Snow." SIRS Discoverer. N.p., n.d. Web. 13 May 2016. <http://discoverer.prod.sirs.com/discoweb/disco/do/picture?picurn=urn%3Asirs%3AUS%3BIMAGE%3BTHM%3B0000162812>. "Red Panda." Sirs Discoverer. N.p. : n.p., 2015. N. pag. SIRS Discoverer. Web. 10 May 2016. <http://discoverer.prod.sirs.com/discoweb/disco/do/article?urn=urn%3Asirs%3AUS%3BARTICLE%3BART%3B0000371568>. "Red Panda." SIRS Discoverer. N.p., n.d. Web. 13 May 2016. <http://discoverer.prod.sirs.com/discoweb/disco/do/picture?picurn=urn%3Asirs%3AUS%3BIMAGE%3BTHM%3B0000080854>. "Red Panda." World Book Advanced. N.p., n.d. Web. 10 May 2016. <http://www.worldbookonline.com/advanced/media?id=pc360357&st=red+pandas>. "Red Panda: Eating." Sir Discoverer. N.p., June 2009. Web. 9 May 2016. <http://discoverer.prod.sirs.com/discoweb/disco/do/article?urn=urn%3Asirs%3AUS%3BARTICLE%3BART%3B0000297821>.